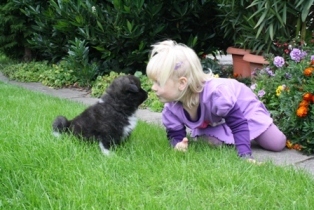 Our puppies are brought up in a loving family atmosphere. A good upbringing is very important in the life of a puppy because that is the foundation for their behavior at a later date. Three weeks after birth our puppies went into our conservatory, which they later use only as their “bedroom”. 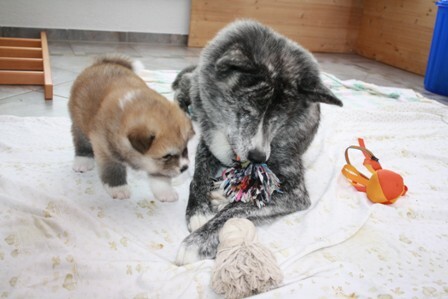 The contact with our adult Akitas grows daily, which ist the basis for a good socialization of the puppies. The little ones gradually get used to householdnoises like vacuum cleaner, radio, telephone etc. Around the clock care goes without saying. 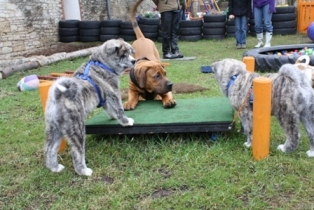 After the 4th week the puppies can discover their own little adventure playground in our garden. 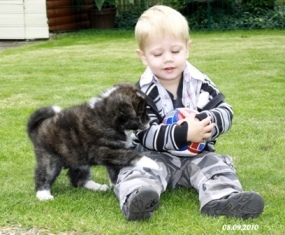 Through playing with their siblings, they learn species-appropriate behaviour. We encourage contact with strangers, children and other four-legged animals. They are confronted with different stimulants like going for a drive in the car, going to practice on a leash, visiting strange appartements and gardens as well as playgrounds for puppies, thereby getting used to different sounds like lawn mower, tractors, bus etc. In addition to that the puppies also get a taste of jogger and cyclists. Up to the time of handing over our puppies (preferably with 10 weeks) they are multiply dewormed, vaccinated, DNA-tested, microchiped and receive an EU- vaccination certificate. Leash and collar, blanket, puppyfood with feeding-recommendations are basic equipment for each puppy that leaves our home. 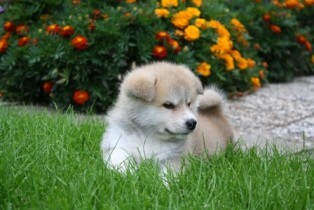 Our aim is to breed vital, friendly and well-balanced Akita, that fulfil the standard. We are members of the Japan Akita e.V. and we support its goals. It is of utmost importance for us to get to know the interested persons of the puppies as early as possible, so that we can inform them about the special charakteristics of this breed. A good contact to our puppy-buyers is very important to us so that we can keep a check on the development of the puppies. If your interest for this breed should be aroused or if you need further information please feel free to contact us at any time via phone or e-mail.